Mariano Rivera became the first MLB player to appear on 100 percent of Hall of Fame ballots. The only question about Mariano Rivera’s candidacy for the Baseball Hall of Fame was whether he would be the first player voted in unanimously by the Baseball Writers’ Association of America, which serves as the primary gatekeeper for entry to the Hall. On Tuesday, the great New York Yankees pitcher became the first player to appear on 100 percent of writers’ ballots, with all 425 voters finally agreeing on something: that Rivera should be enshrined in Cooperstown, New York. With his ballot sweep, the fearsome closer did something unmatched by even the greatest of his starting pitcher brethren, including Nolan Ryan, Greg Maddux, Tom Seaver and Randy Johnson — all of whom topped 97 percent. Three years ago, Ken Griffey Jr. came the closest to complete consensus when he received 99.32 percent of the vote — just three ballots short. Rivera, eligible for the first time this year, was joined by three other inductees — the late Roy Halladay (85.4 percent of ballots), longtime Seattle designated hitter Edgar Martinez (85.4 percent) and former Oriole and Yankee pitcher Mike Mussina (76.7 percent).1 Based on ballots that had been made public before the announcement, we were expecting that Rivera, Halladay and Martinez would gain entry to the Hall. As of our last model run,2 we thought Mussina was just a borderline case. *With 232 public ballots known. Appearing fifth, sixth and seventh in the actual voting were Curt Schilling, Roger Clemens and Barry Bonds. Schilling jumped to 60.9 percent from 51.2 percent last year. He has three years of eligibility remaining on the BBWAA ballot. 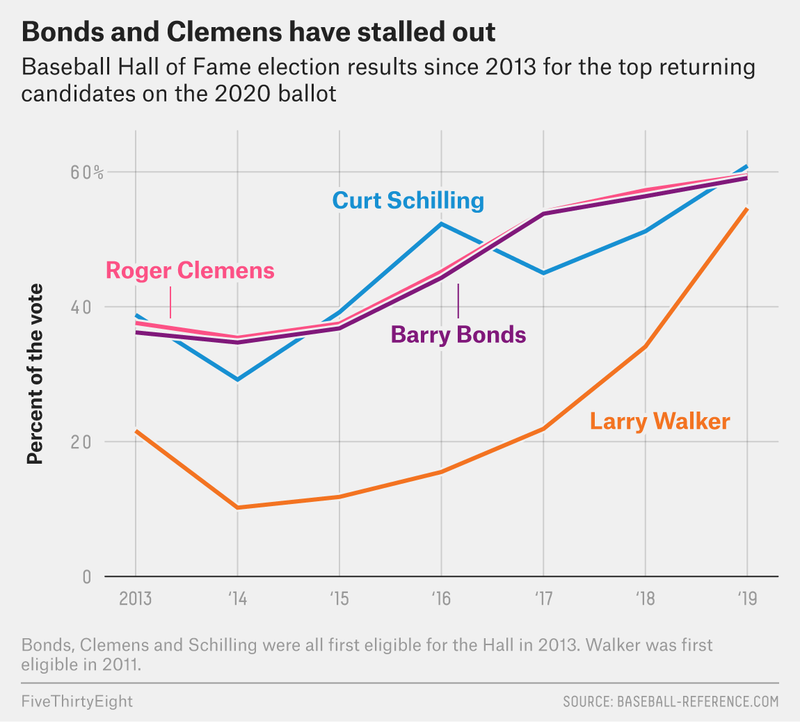 Meanwhile, Bonds and Clemens, whose careers were tainted by allegations of performance-enhancing drug use, could only inch up on a crowded field. Clemens received 59.5 percent, up from 57.3 percent last year. Bonds received 59.1 percent of the vote, up from 56.4 percent in 2018. Their glacial rate of improvement means they will be hard-pressed to hit the required 75 percent in their three remaining years on the ballot; they appear to have hit a plateau. Walker, however, is rapidly trending toward Cooperstown: He ranked eighth in voting percentage (54.6 percent), making a substantial leap from 34.1 percent last year. Next year will be his final year of eligibility, and he’s still 20 points short of election — usually an impossible task. But this year proved that Walker is capable of such a massive gain, so his candidacy is likely to provide genuine suspense next year. But Tuesday was headlined by Rivera making history. Anyone familiar with baseball knows of Rivera’s excellence. There is a strong case to be made that he is the greatest reliever in history. The 13-time All-Star is the sport’s all-time saves leader with 652. He was a part of five World Series championship teams in New York. In addition to his regular-season dominance, he has the lowest career postseason ERA (0.70) and most playoff saves (42) in MLB history. And when using advanced measures to evaluate performance, Rivera stands out not just as a great relief pitcher — only Dennis Eckersley ranks higher among relievers in the JAWS metric that combines career and peak performance to evaluate Hall candidates — but as an all-time great pitcher regardless of role. His ERA+ — which adjusts a pitcher’s earned run average for ballpark and run environment, enabling comparison between eras — ranks No. 1 all-time among all pitchers (minimum 1,000 innings). Traditional statistics like wins and saves are increasingly viewed as poor measures to evaluate performance because they award or penalize pitchers for many factors out of their control. But even the most common new-age measure to evaluate performance, wins above replacement, is inadequate to measure reliever performance because it is in part volume-based, and relievers pitch fewer innings than starters. Better measures to evaluate the performance of relief pitchers are statistics like win probability added, which tallies the change in win expectancy between plate appearance, and a context-neutral version of win probability added (WPA/leverage index). For instance, Rivera is 77th all-time in Baseball-Reference.com pitching WAR. But he ranks fifth all-time in WPA (56.6), trailing only Clemens, Lefty Grove, Maddux and Warren Spahn. In other words, he’s among the elite of the elite. Of course, relievers face a greater proportion of high-leverage situations than starting pitchers do; protecting a one-run lead in the ninth inning is more critical than pitching with a one-run lead in, say, the second. But even when employing a context-neutral win probability (WPA/leverage index), Rivera still ranks as the 21st-most win-adding pitcher of all time and is 13 spots higher than the next reliever (Hoyt Wilhelm at No. 34). Rivera combined elite command with an almost unhittable pitch: his cut fastball. Though just a portion of his career took place during the pitch-tracking era, he ranks second to Dodgers stopper Kenley Jansen in the run value of his cutter. Rivera is just the eighth pitcher to work primarily as reliever to be enshrined. The others are Wilhelm, Rollie Fingers, Eckersley, Bruce Sutter, Goose Gossage, Trevor Hoffman and Lee Smith. Three have joined the Hall since last year — Rivera, Smith (veterans committee, 2019) and Hoffman (BBWAA vote, 2018) — and the number of relievers figures to grow over time as bullpens are used in an ever-greater share of innings. Last season, relievers accounted for a record 40.1 percent of innings. The only position group with fewer players in the Hall than relief pitchers is the designated hitter group. Despite not playing a position in the field for much of his career, Martinez’s bat was so dominant that he made it to the Hall in his final year on the ballot. Martinez’s career OPS+4 of 147 is tied for the 42nd-best mark of all time. Martinez joins Frank Thomas and Harold Baines — another 2019 veterans committee selection5 — as the only players in the Hall to play more than half their games at DH. Thomas ranks 52nd all time in batting WAR (73.9), while Martinez ranks 80th (68.4). Halladay, who died in a 2017 plane crash, tied with Bob Feller for 41st in all-time pitching WAR (65.5). He tied for 37th in all-time ERA+ (131). The two-time Cy Young Award winner was the ultimate workhorse for his era, leading his league in innings pitched four times and exceeding 230 innings six times. He’s also the only player other than Don Larsen to throw a no-hitter in the postseason. Mussina pitched in hitter-favorable ballparks and during the high scoring “steroid era” of the late 1990s to early 2000s. While his traditional stats might not seem elite, his career WAR (83.0) and JAWS (63.8) totals rank ahead of the average (73.4 WAR, 61.8 JAWS) for Hall of Fame pitchers. A few years ago, it was hard to imagine pitchers like Mussina, with a 3.68 ERA before adjustments, or Halladay, with barely 200 wins, getting into the Hall of Fame. And it was probably unthinkable that anyone — let alone a relief pitcher — would be elected unanimously. But the Hall of Fame electorate is changing, and that seems to be increasing both the quality and quantity of the players being elected. Voters are limited to 10 names per ballot. Conducted just a few minutes before the announcement, when 232 ballots had been revealed. Shoutout to Jason Sardell, whose alternative model did even better, with an average error of 0.9 points. OPS+ considers a hitter’s overall ability but adjusts to account for ballpark and run-scoring environment. An OPS+ of 100 is league average. Baines, a controversial pick in December, had a career OPS+ of 121, tied for 340th place.